"Get Your DIY Project Going With These Free Shed Prints"
Several e-mails come to us asking if we have free shed blueprints. The requests come from web surfers like you, looking for simple shed plans to help build a functional and attractive storage unit for your yard. With so many DIY barn and shed builders in the do-it-yourself community, it is no wonder that we receive such large requests for free shed prints. We've recently gathered an extensive list of resources for free storage shed plans. Some common requests we receive are for 12x6, 12x10, 8x12 and even 12x16 sheds. We have listed the resources we have come across below. In addition to these plans, some may also include instructions on how to build a storage shed as well as a list of materials required for the project. A. They are completely free shed plans. B. Some of you may find that you need a set of customized professional CAD drawings created for you. If you need your shed plans customized to suit, please send your scanned images to us by e-mail. We will get back in touch with you with a quote for creating a set of custom shed blueprints. 8X12 Shed Plans - Download this free shed plan. Includes all the info you need to construct your own shed. Shed Drawings - 4 different types of outdoor storage sheds provided by the University of Tennessee. UofT Cool Moveable Shed Plan - 144 square foot storage building. Colonial-Style Storage Shed - Step by step workshop plans and instructions on how to build this 10 x 16 shed. 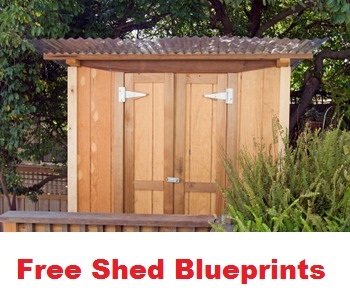 10 x 8 Free Shed Blueprints - 16 pages for you to download, print and get started building a storage shed. Garden Tool Shed - How to build a simple garden tool shed. 10 x 12 Barn Style Shed - Another UofT free blue print with a bill of materials list of items. Free Utility Shed Plans - With a shed roof. Garden Shed Building Plans - A continuation of free shed blueprints on our site. Many homeowners prefer to utilize storage sheds plans when assembling their backyard structure to ensure it looks professionally built. Since building a shed is one of the easier handyman tasks, building a structure of this nature has become quite a popular do-it-yourselfproject. 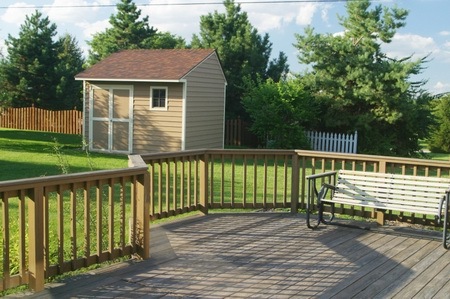 Your backyard structure need not be an eye sore. A box made of plywood with a door is not what your project needs to look like. It can be built to fit in with your backyard theme or to match the outside of your house. In addition to adding aesthetics to your yard, having a beautiful shed in your backyard is a great way to keep those garden tools and toys off the lawn. Whether it’s a storage structure, garden house, or a play house for the kids, we can provide you with an assortment of plans to meet your personal taste. If you have some rough sketches or pictures of what you are after, we can work with you to develop a set of plans that are right for you and your home. Please let a friend know that may also find this free shed construction page useful.